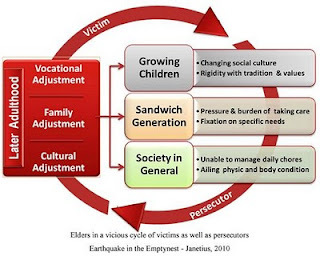 Lack of adjustment to the various areas of life (like cultural adjustment, vocational/professional adjustment and family adjustment) the elders are placed in a precarious situation of both victims as well as persecutors. In the eyes of the growing children, the non-ability of the elders to understand and adopt the changing cultural values and the modern social trends, on top of all, rigidity in holding personal likes and dislikes make them persecutors. These again lead to victimization from the part of younger generation. 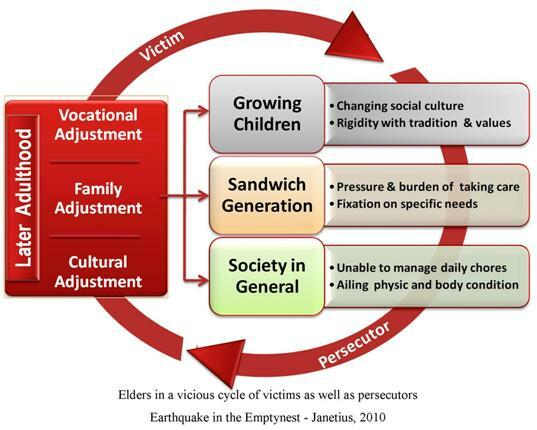 For the sandwich-generation, elders are an added burden in their daily struggle with their children. The fixations of elders for specific needs and demands add fuel to this issue. In the modern urban as well as semi-urban settings, where both the couple go for job, it is rather inconvenient and impractical to attend the needs of one's own parents in every detail. Added to that, is the bitter fact that some elders are abusive and repressive. Take for example our familiar mother-in-law stories. Here too, they are forcefully placed in a vicious cycle of being both the persecutors and the victims. In addition, the weak physical body and the inability to do many chores place the elders in various social situations in the same vicious cycle.